Who would have thought scallions and batter would taste so good together? What? Korea has a sort of dinner pancakes made from more veggies than batter? And Trader Joe’s has brought it to us under the simple, if intriguing, name of Scallion Pancakes? This sort of esoteric awesomeness is exactly what I made this blog for. What are you, scallion pancakes? What are, as the South Koreans say, pa jeon? I wondered these things as I stood stupid in the frozen food aisle. I tried smelling the bag. No luck there – the strange mystery of scallion pancakes was securely locked inside the cheerful green sack. Was it really just pancakes made with wild green onions? Could that possibly be any good? If pa jeon was a product of, say, Swinton England, I would guess no – but this is a tradition Korean food and I’ve done pretty well by those so far, despite the occasionally debacle, so I was willing to give it the old college try. Was this going to be another Spicy Seaweed Salad or just another dehydrated kimchi? 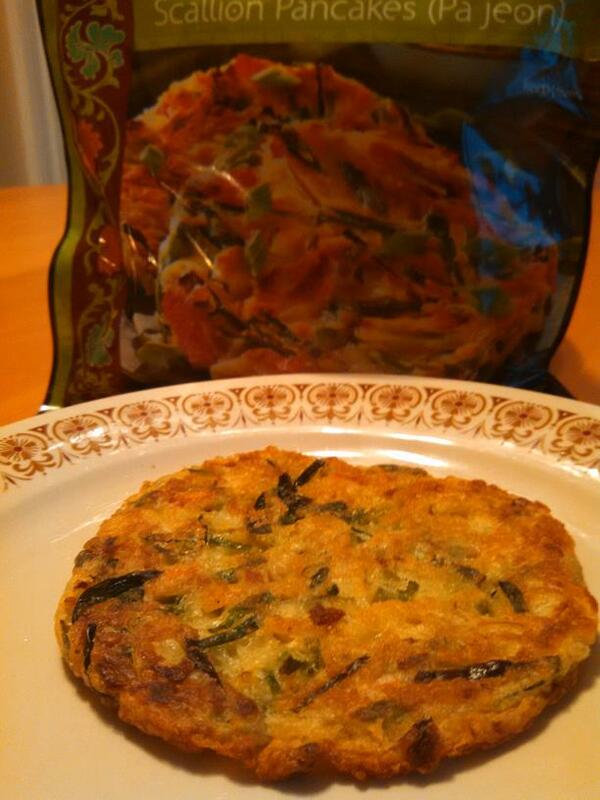 Fortunately, it’s my pleasure to report that Trader Joe’s Scallion Pancakes are totally awesome. Jeon in Korean (pronounced “jun”) means something like “battered stuff”, while pa means scallions (aka green onions). Pa is by no means the only Jeon out there – the Koreans really went to town on the whole notion. Where Americans were content to put some bananas in their flapjacks then rest on their laurels, the South Koreans diced up basically anything they could get their hands on. While the scallions and batter are usually there, it can come loaded up with any sort of seafood or meat imaginable. Trader Joe’s gives us the most basic version here – plain green onions with a smattering of other vegetables, including leeks and onions plus some carrots and oyster mushrooms. If pretty much anything can go into a scallion pancake, you might wonder why the Koreans insist on keeping the scallions in there at all. The answer is one, because they are super delicious, and two, because of history. As well as I could dig up, pa jeon owes its existence to a bunch of Koreans that started throwing green onions at retreating Japanese soldiers during one of the numerous Japanese-Korean battles of the the late 16th century. Obviously, that led immediately to people cooking them into pancakes for some reason. There’s no figuring out history folks, it’s just a bunch of crazy stuff like that. At any rate, scallion pancakes are exactly what they sound like – each bag contains four danish sized “pancakes” made with a wheat and egg batter mixed with, you guessed it, scallions. I put pancake is quotes because the word doesn’t quite do justice to what you’re getting. The shape is approximately that of a nice sized buttermilk flapjack, flat, smooth, rounded and about a ¼ inch thick, but that’s where the resemblance ends. The pa jeon batter is very different from pancake batter. Trader Joe’s uses a mix of wheat flour, corn powder, baking powder, and a touch of egg in their mix, and the result is something more like bread dough than pancake batter – a difference that comes to the fore when you fry them up. Instead of staying light and fluffy, like they are when they come out the bag, the pa jeon become golden and crispy on the stove top. This crispy crunchiness is delightfully toothsome, with a somewhat flaky and pastry-like crunch to the bite. Once you do throw your scallion pancakes on the stove, get ready for a room filling aroma of mouthwatering proportions. The mixture of onions, leeks, mushrooms and other veggies smells warm, rich and hearty – expect people to be popping their heads in to see what smells so good. A single glance at these scallion pancakes makes it obvious that they are packed with all sorts of vegetables. What’s more surprising is how much oil is in there as well. Whether you cook these up in a frying pan or in the oven, you’ll notice the pool of oil that forms around each cake. 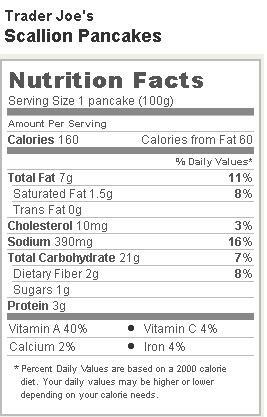 With 7 grams of fat in each pancake and 21 grams of carbs, these are more savory appetizer than health food. On the other hand, with only 160 calories in each pancake, and so much vegetable filler, you can fret the guilt off pretty quickly. A final note – although Trader Joe’s doesn’t mention it on the bag, you’ll want to eat the scallion pancakes with a traditional dipping sauce of some kind. The most basic type (which worked well for me) is just to mix up a little bit of soy sauce and white (or rice) vinegar. If you’re looking for a fancier sauce recipe, you can try this rather complex one http://www.trifood.com/pajeon.asp. Would I Recommend Them: If you’ve never tried a savory pancake before, you should try these. Would I Buy Them Again: Yes indeed – these make great snacks/appetizers/sides. Final synopsis: Crispy, scallion filled pancakes that prove the Koreans know what they’re doing in the kitchen. Toothsome, indeed! With a sprinkle of hot pepper flakes, and a smattering of soy sauce, these were incredibly yummy. I tried these with the Korean Pork Shoulder for dinner last night…HOLY HEAVEN! I warmed up the leftovers (very little of them) for lunch and a co-worker who is not the most adventurous eater asked what smelled so delicious. I told him what it was and he plans to stop by TJ’s tonight to pick some up. This will definitely be a regular meal for me! Unfortunately the NYC stores have been out of these for months, as they are out of a lot of things lately. Supposedly for “quality issues”. I thought the quality was excellent! I absolutely love them! I pan cook them in TJ’s Cal Estate Olive Oil spiced with either TJ’s Lemon Pepper or TJ’s South African Smoke + TJ’s Ghost Chiles. Then I sunnyside an egg and break open and spread the cooked egg yolk over the cooked pa’jeon and then lay the cooked egg white on top. Then I cut it up into bite size pieces and thoroughly enjoy it. FYI this is one full meal for me. p.s. so sad that South African Smoke may have been discontinued, hopefully as rumored it will come back on to their shelves, even seasonally would be awesome!